I’m proud to announce that I have been asked to be part of the 2018 Preble County Author Con, to be held at the Eaton Library (301 N. Barron Street, Eaton, OH 45320). The event will be from 10:00 am until 2:00 pm on Saturday, Mat 26th. I will be joining nine other Ohio authors for a day filled with panel discussions, children’s crafts, and, best of all, free popcorn! I’ll be bringing along a trunk-full of books for purchase and I will be more than happy to scribble my name in them…or anything else you put in front of me! And you missed me, didn’t you? 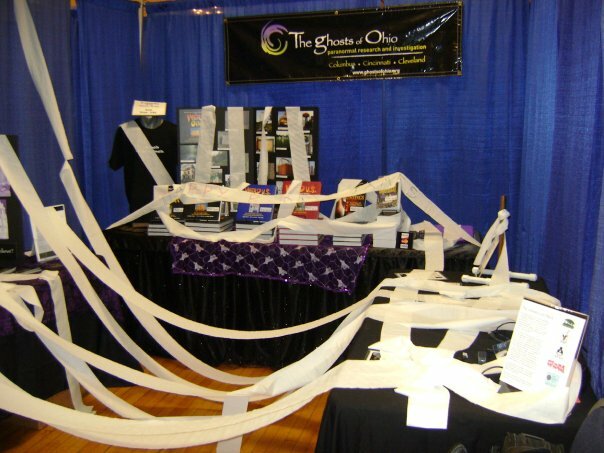 Those of you who have been following this blog for a while know that it traditionally goes “dark” every October since I am usually out running all over Ohio with presentations and appearances. This year was no different, but the blog remained dark through November and December. Why, you ask? Well, even if you didn’t ask, I’m going to tell you. Simply put, I had an end-of-year deadline to submit the manuscript for my next book to the publisher. Yup, there will be another James A. Willis tome heading your way for 2017. What’s it about? Well, I’m supposed to keep it a secret for now. But I can tell you that the focus will be on central Ohio and will contain Weird Ohio-type stories that you all seem to love so much. In other words, I’ve spent the last few months chasing down leads on Central Ohio serial killers, legendary locations, and even a UFO or two. No worries, there’s a couple of ghost stories in there, too. So now that I’m back, what can you expect from this site? Well, for starters, we’re going to finally finish up the remaining Crybaby Bridge locations. I’ve got a whole mess of personal experiences about a bunch of the bridges that you’ve sent me, so those will start being added, too. The Strange & Spooky Museum has gained quite a number of new pieces and those are in the process of being catalogued and photographed. Expect to start seeing those popping up on the site, too. There’s even a couple of pieces that are supposed to be so haunted that a mere glance at them will cause people to experience all sorts of bad luck. Not sure if that means you can’t even view them over the Internet, so perhaps I need to have everyone sign a Virtual Waiver before looking at these “cursed” objects! Finally, I’m going to be embarking on something really strange and spooky this year and you’ll have the chance to come along. So get ready because in a few short months, we’re going monster hunting! Create Your Very Own Loveland Frog Hoax For Under $20.00! I swear on my grandmother’s grave that this is the truth. I’m not sure whether it was a Frogman or just a giant frog. Either way, I’ve never seen anything like it. Let me start off by saying I have been fascinated with the legend of the Loveland Frog for decades. Not only is it a cryptid that is unique to Ohio, but the stories have grown and mutated over the years to include such things as police officers shooting at a 4-foot tall frog/man hybrid walking on two legs to witnesses continually changing their stories over the years. The legend had everything, it would seem, except for any photographs of the elusive creature. 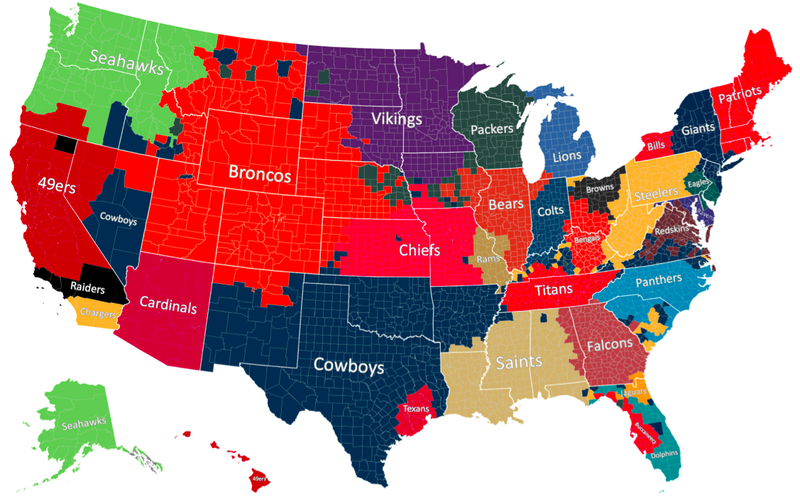 All that changed last week…or so some would have you believe. According to an article on WCPO.com, a man and his girlfriend were playing Pokemon Go between Loveland-Madeira Road and Lake Isabella on the evening of Wednesday, August 3rd, when they encountered what they believed could have been the Loveland Frog. To be honest, when I first saw the photos and video, I wasn’t impressed. The dimensions seemed way off: it looked way too small to be something that was supposed to be “4 foot tall”. And what was up with those high-beam eyes? But most of all, the whole thing screamed hoax because once again, when someone spots a cryptid, they never attempt to chase it, follow it, or do anything other than take a few dark, blurry photos and a shaky video. Didn’t make sense to me. OK, technically it wasn’t the Loveland Frog–it is officially known as the “Wilson & Fisher Solar Frog”. And I’m not saying this is the exact thing that appears in Sam Jacobs’ photos and video. But man, is it close! For me the clincher was when I tried to recreate Jacobs’ video. I didn’t bother getting all Shaky Cam on you, but I did attempt to make the frog turn, as in Jacobs’ video. I even tried to do a little super-spooky thing where the frog disappears. How do you think I did? Couple of things to point out about the videos. If you notice in Jacobs’ video, the eyes never blink. In fact, when the “creature” turns, both eyes still remain unchanged–no blinking or closing. They might look like they are moving, but it’s only because the entire thing is moving. How did I get my figure to move? It was simple. The figure’s left leg made a perfect handle. During the video, which my wife shot, I was standing behind the figure. When I wanted it to “disappear”, I just bent down, grabbed the figure’s leg, and turned the whole thing towards me, blocking out the light from its eyes. So does this solve the mystery? Not necessarily. As I mentioned, I’m not saying this was the EXACT statue that was used. To be fair, there were also solar-powered alligators and other critters at Big Lots. But you have to admit that it seems something more than mere coincidence that I was able to recreate alleged photos and video of the Loveland Frog with nothing more than $20.00 and in less than 20 minutes (BTW, it would have been 10, but I had to wait for the sun to set). Heck, I didn’t even try to cover up the statue’s cheesy pink lily pad/flower thing! My point is, if you’re planning on hoaxing something like this, please put a little more time and effort into it. As a member of a subculture that’s willing to entertain the idea that there are things in this world we can’t explain, it’s a little depressing to think there are people who think we would be so easily duped. Of course, the fact that my wife and I may have figured out this little mystery while randomly roaming through Big Lots seems a fitting end to this tale. Now, can someone do me a favor and help me get this guy out of my recliner? Or at the very least, give up the remote? You can read the original WCPO.com article in its entirety by clicking here. A subsequent WCPO.com article, in which one of the original witnesses from 1972 now claims the story is a hoax, can be read here. For more information on the Loveland Frog legend, go here. Want your very own Loveland Frog Hoax statue? They are on sale right now at Big Lots! Originally $30.00, you can get one for the low, low price of $15.00 with their whole Summer Clearance thing going on. Yup, the Interwebs and anti-social media are all a-flutter with this new viral (god, I hate that term) craze that’s sweeping the nation. 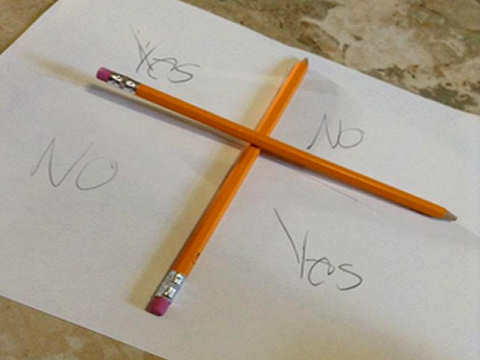 Apparently, “teens everywhere” are dividing pieces of paper into 4 quadrants, balancing pencils in the middle, and commanding a demon to come and answer their burning questions in a game that’s become known as Charlie, Charlie. That’s right: Of all the denizens of Hell, Charlie is the one you need to reach out to if you need your questions answered. And make sure you specifically ask for “Charlie, the Mexican demon.” God forbid you get stuck with “Charlie, the American demon” or even “Charlie the Norwegian demon” because you’ll be lucky to get anything useful out of those guys. So what exactly are “teens everywhere” doing? Well, not that I’m condoning this type of behavior, but the whole thing’s really simple. You just need a piece of paper and two pencils. 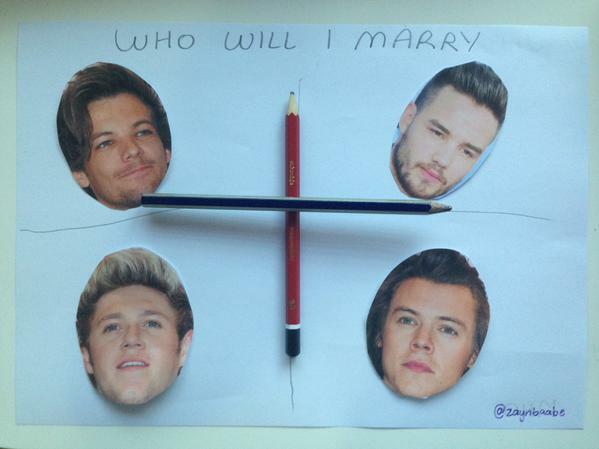 Take the piece of paper and draw a giant plus sign on it so as to divide the page into 4 sections. Then, write down 4 “answers” with one in each box: “Yes” and “No” are the popular favorites, but feel free to mix in a “Maybe” or an “Ask Again Later” just to give ol’ Charlie some variety. For the final step, place one of the pencils on the vertical axis (i.e., the line going up and down) and then balance the second pencil across the first one (i.e., so it is laying horizontally). Then, ask away! 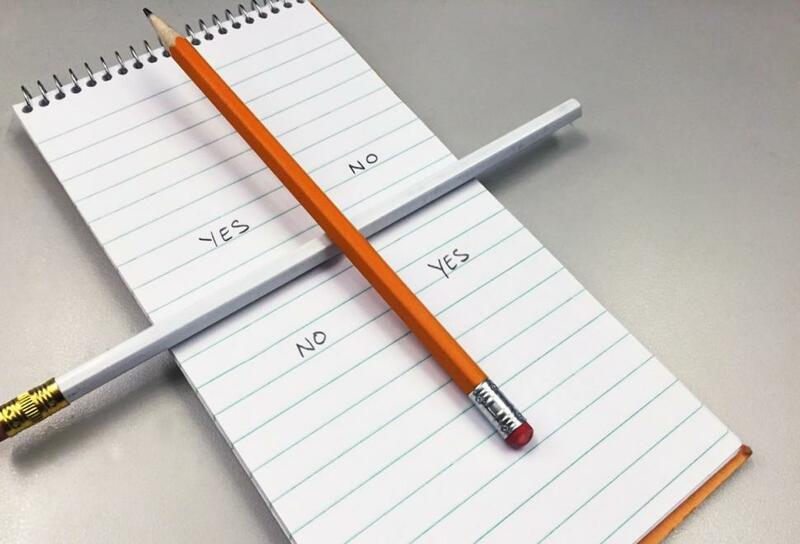 So far, the popular way to ask seems to be by saying “Charlie, Charlie, can we talk?” It is said that if Charlie’s around, the top pencil will spin to “Yes” (so you better make sure you have a “yes” on your paper or you’re screwed from the get-go). Once Charlie answers, you’re off and running. Now, aside from the fact that balancing a pencil on top of another one makes it quite easy to get it to move, let’s talk for a moment about the utter silliness of this activity being blamed on Charlie, the Mexican Demon. All of the other paranormal imports from Mexico have at least retained their Spanish names–Chupacabra, La Llorona, etc. So why not this demon? And when did we stop giving demons really spooky (and usually unpronounceable) names? Online demonologists (who scare me for totally different reasons) are claiming that the demon only calls himself Charlie because it’s an “unassuming name” that allows him (it?) to lure teens over to the dark side. I guess that could be it. Of course, it doesn’t explain why, up until a few days ago, Charlie the demon and even this “game” simply did not exist. In fact, until it went viral (there’s that damn word again), it doesn’t appear that anyone had even played this particular game before. There does appear to be a game known as “The Pencil Game” that involves making a rectangle by sticking 6 pencils together and holding it in the air while chanting “Charlie, Charlie, can we play” (see a video of kids playing that version here). But this whole “hey, demon, can you spin this pencil for me” is something new. So come now, people, don’t we have better things to do than engage in this silliness? 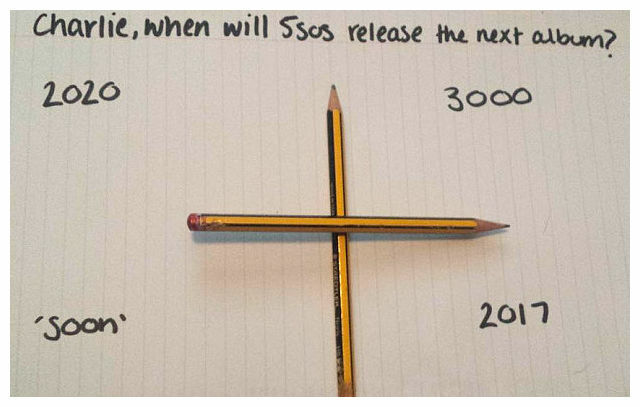 Even if this were true, think of poor Charlie the Mexican demon: having to be ready to race around the world at a moment’s notice, usually on the whim of some random teenagers who is just dying to know when 5 Seconds Of Summer is going to “release the next album” (and yes, I’m old, so I had to Google “5SoS”). If you ask me, I think Charlie got the short end of the stick. But then again, he is in hell, so I guess he deserves it. Click here to check out the BBC’s article concerning where Charlie, Charlie might have originated. Here’s what the NY Daily News is saying about Charlie, Charlie. Read about Doubtful News‘ take on Charlie, Charlie by clicking here. PIX11 has more on the story, including several videos showing people attempting to contact Charlie. Check it out here. Vine compilation of people playing (and parodying) Charlie, Charlie (NSFW–Language). In the past 24 hours, I have been forwarded over a dozen links to articles about the Zombie Cat in Tampa Bay, Florida. It’s a weird story, to be sure, but not something I planned on posting on this blog since it was really just a commentary on what some animals will do to stay alive. If you haven’t seen the story yet, Bart the cat was recently hit by a car and by all accounts, it was a really bad accident. In fact, when Bart’s owner, Ellis Hudson, came home and found the cat, still lying in the road, he thought Bart was dead. Hudson was so distraught that he couldn’t even bring himself to bury Bart, so a neighbor volunteered to do it. Five days later, a still-bloodied Bart showed up on a neighbor’s doorstep. Apparently, Bart had been in a coma-like state that had slowed his breathing to the point that his emotional owner (and neighbor, apparently) didn’t notice the cat was still alive. So they, in effect, buried the cat alive. Somehow, Bart managed to dig himself out of his grave and make it back home. It’s a rather heart-warming story, in a twisted sort of way. But as I said, I wasn’t planning on writing anything about it. Of course, all that changed the second Columbus’ ABC-6 showed up. Now, I can forgive Scalia for leaving out a wiggle word like “apparently”, so as to imply that the cat only appeared to be dead. But seriously, Ms. Bruck, where did these magical vets come from who pronounced Bart DOA? There were no veterinarians involved! The owner came home, thought his cat was dead, and buried it. No veterinarians anywhere. What’s more, Bruck clearly says “vets”, so there’s more than one of these mysterious people involved! Spooooooky! So see, they did clear up the whole idea that the cat really wasn’t dead by adding “presumed dead” into the article. But look! Now we have a car-on-car homicide taking place! “A car is hit by a car”? And those mysterious “local veterinarians” are still lurking about. 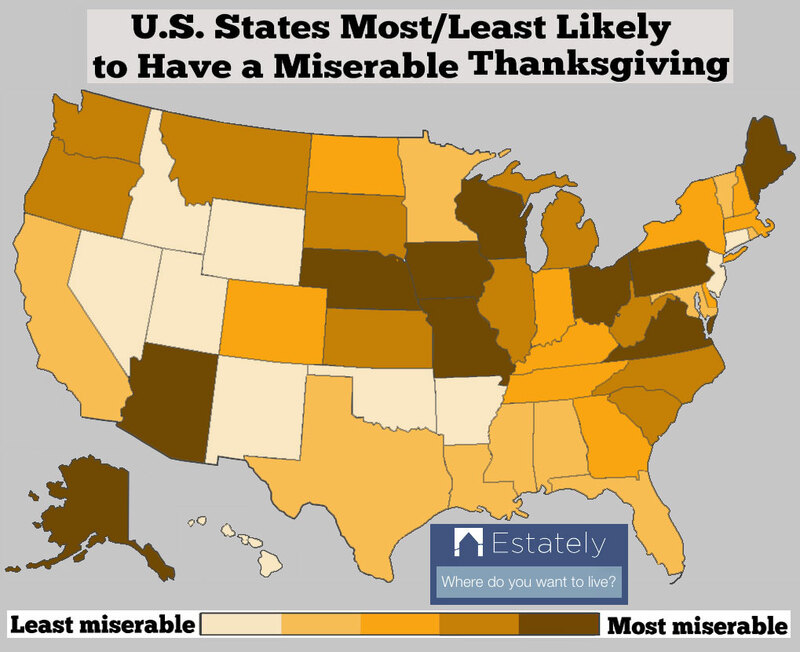 But I guess we need to look at the bright side. These guys are still “local”, meaning we have some time to prepare before they start migrating North, randomly pronouncing beloved family pets “dead” along the way. On the one hand, you could chalk this all up to shoddy (and somewhat lazy) reporting. I, on the other hand, have a different opinion. I think the local weathermen are to blame. Let’s face it: they can’t ever get the weather right, even with all their fancy “models”. So why we would expect them to get a story about a zombie cat right? Read ABC-6’s error-filled report (unless they update it again) on Bart the cat here. 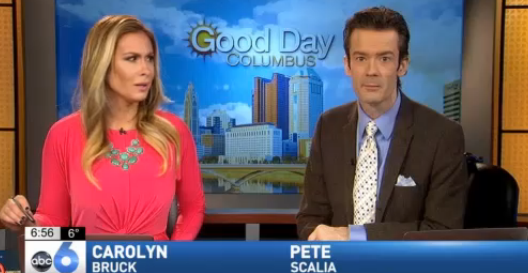 There’s also video of the original Good Morning Columbus segment. For the real details of Bart the cat, go here. The Animal Health Center at the Humane Society of Tampa Bay is currently caring for Bart and providing updates on their Facebook page. You can access that page right here. According to The Toledo Blade, in the early morning hours of Wednesday, January 21st, police attempted to make a traffic stop on a vehicle as it approached the intersection of Ash Street and Stickney Avenue in Toledo. Rather than pull over, the driver, 33-year-old Jason Davis, instead decided to take off and attempt to outrun the patrol car. The chase was on! As he drove down Central Avenue, police in pursuit, Davis made a move that, while it might not have been part of his unofficial escape plan, will certainly cause him to spend the rest of his days in infamy: he drove into the parking lot of the Toledo Correctional Institution. But to be honest, he didn’t just drive in. Rather, Davis was so insistent to get into the prison, that he crashed through a closed gate. Once in the parking lot, Davis attempted to elude police by driving onto the prison’s internal driveway, which is basically a giant loop around the walls of the prison. Police simply waited patiently for Davis to complete his roundabout tour of the prison. When he returned to the parking lot, police deployed Stop Sticks and brought the chase to a close. 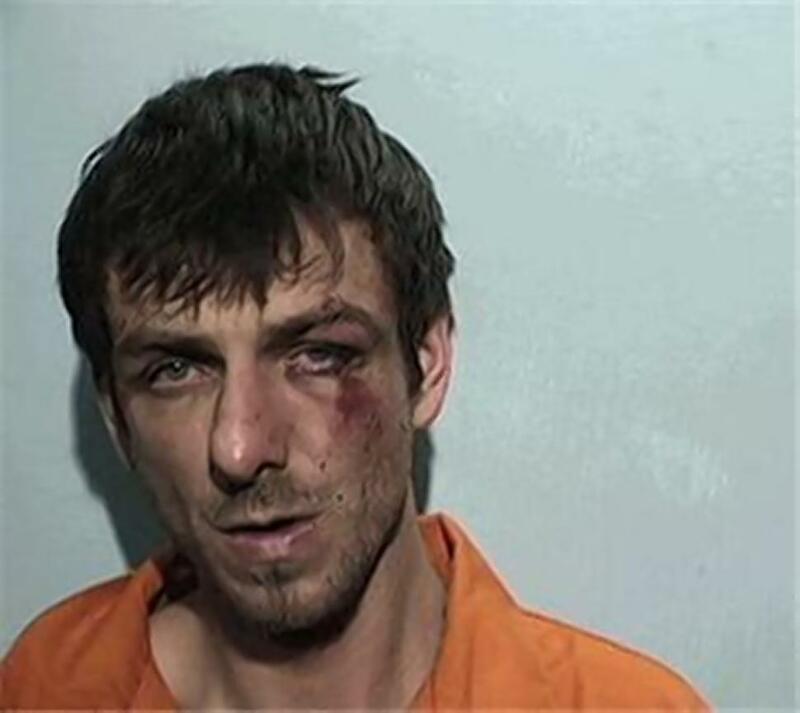 Davis was arrested and is scheduled to be arraigned in Toledo Municipal Court today (Thursday the 22nd). He is charged with two counts of vandalism of government property, failure to comply, possession of drugs, resisting arrest, obstructing official business, drug paraphernalia, and failure to stop at a stop sign. Oh yeah, and not using a turn signal. No word if Davis had time to pick out a cell while he was on his private tour of the prison. You can read the entire report from The Toledo Blade here. 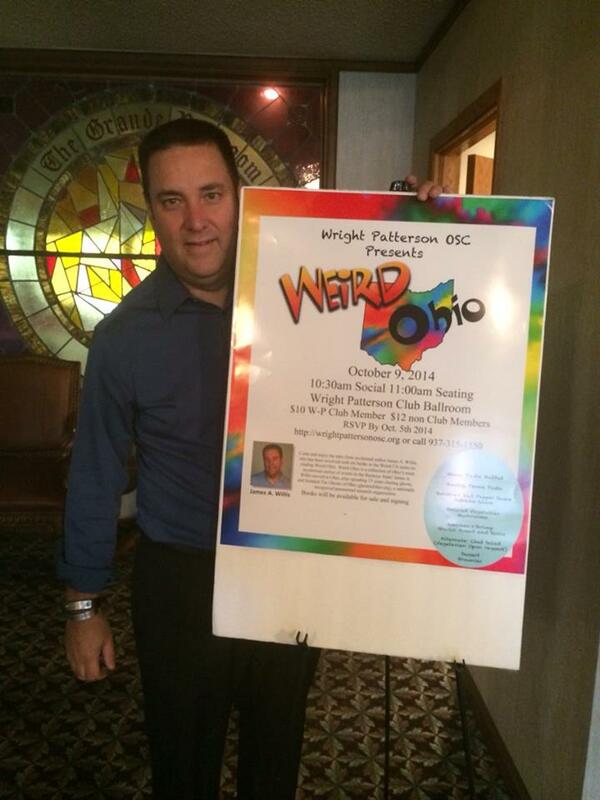 Can’t get enough Ohio News of the Weird? Click here for the ONW Archives. Back in 1959, carloads of local teens descended on the tiny village of Mogadore, Ohio, with the intent of finding a ghost. Some actually claimed to have seen a ghost or two. And at least a couple of them got more than they bargained for. 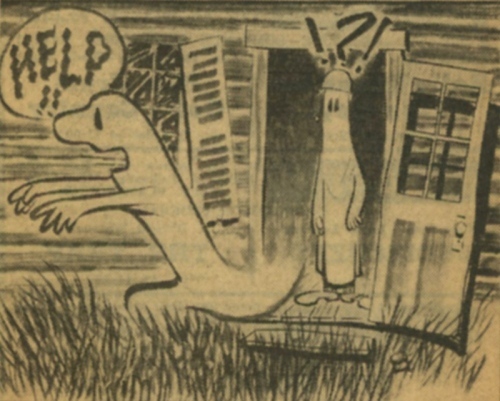 This wasn’t the first time Mogadore had gotten all Ghost Crazy. Back in November of 1906, after a rash of reported ghost sightings in the village, the Canton Morning News declared the village of Mogadore to be “in the throes of a ghost scare.” Seems that people were wandering the streets of Mogadore at night, looking for ghosts. One particular evening, a group of teens were driving towards Mogadore with the intent of doing a little ghost hunting themselves. Right at the outskirts of Mogadore, they were flagged down by a man who said he was a photographer from the Beacon Journal newspaper, out on a special assignment. 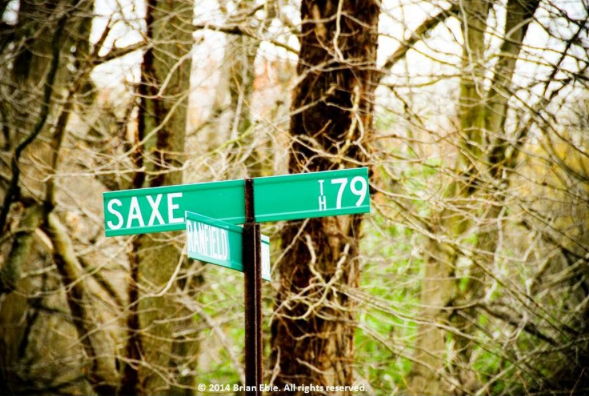 Specifically, he was to try and photograph one of the ghosts of Mogadore, which had recently been spotted at an old abandoned house over on Saxe Road. When the photographer asked the teens if they wanted to accompany him on his little ghost hunt, they readily agreed and they were all soon on their way to the abandoned house. Once there, the group grabbed a flashlight and began making their way up the driveway to the front door of the house. They were halfway to the door when they heard a strange noise coming from some nearby trees. Turning, they were shocked to see a ghostly white figure appear from behind a tree and start advancing towards them. The group scattered, with one of them literally running into a fence, catching his clothes in the process. Perhaps seeing one of their friends in pain steeled the group, for almost in unison, they turned, grabbed some rocks, and being chucking them at the ghost. Apparently, ghosts are afraid of rocks because the spooky figure retreated into the abandoned house, where it promptly vanished. 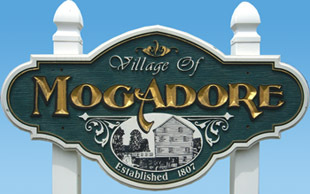 Shaken by the incident, the group drove to the Mogadore police station and reported what had happened. Patrolmen and Portage County deputies were dispatched to the abandoned house, but they found no signs of any ghosts. As they were preparing to leave, they noticed a car on the side of the road with its hood up. Taking a closer look, police found two men and a woman, wrestling with a dead car battery. Nothing out of the ordinary. Well, not until you take into account the fact that one of the men’s face appeared to be covered in white shoe polish. Or that there was a ghostly white sheet and a white helmet in their trunk. When confronted, the three admitted that they were the ones “haunting” the abandoned house. The plan had been hatched by friends Thomas Baumgartner and Richard Hamilton. After hearing so many people talking about seeing a ghost in Mogadore, the pair decided to have a little fun. For his part, Baumgartner would paint his face, put on the ghost costume, and hang out near the abandoned house. Hamilton would be responsible for bringing people to the house by posing as a local photographer covering a story. Baumgartner’s wife, Judith, wasn’t part of the plan, but still decided to tag along and watch it all go down from a hiding spot near the house. Both men were charged with disturbing the peace and fined $50 ($30 of which was to be suspended if they kept their noses clean for at least a year). Judith Baumgartner was not charged. And with that, the case of the Mogadore Ghost came to a close. Or did it? 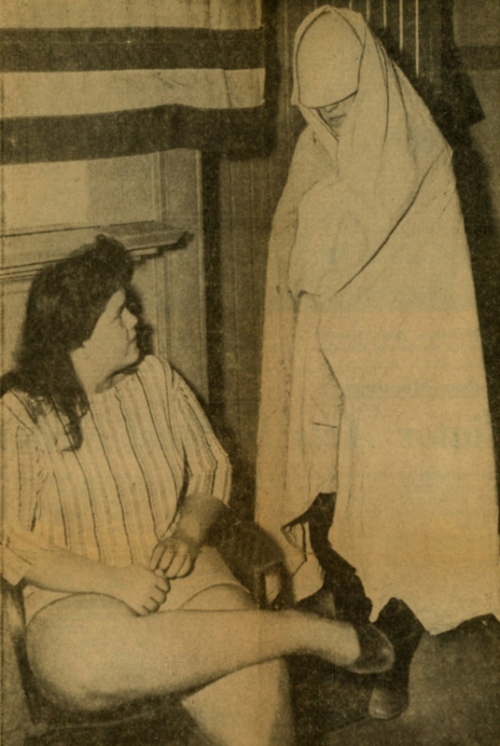 For while dozens of people had reported seeing the ghost of Mogadore over the course of several months, both Baumgartner and Hamilton maintained that they had only pulled their little prank once–the night they were caught. So who or what were all these other people seeing? A real ghost? Or just other pranksters? That question may never be answered, although it did give several people a chuckle pondering what would have happened if the pranksters and a real ghost decided to show up at that spooky old house on the same night at the same time! The original article on this story, written by Mark J. Price, can be found here. For more great stories from Mark J. Price, check out his book The Rest Is History: True Tales From Akron’s Vibrant Past. How Far To Gotham City? 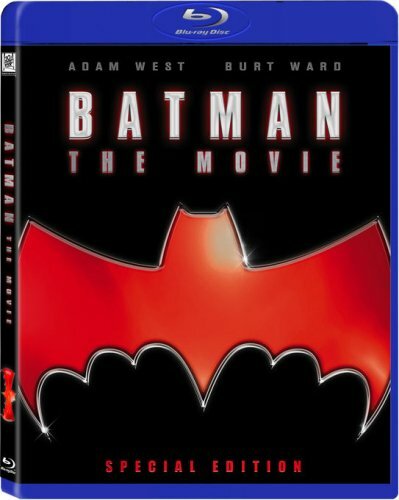 It seems only appropriate that on the eve of the release of perhaps the greatest Blu-ray box set the world has ever known, I come clean about something Bat-related. Namely, that it took the Caped Crusader’s snubbing of my daughter to find out my Bat Library was missing an essential book. The book? Gotham City: 14 Miles. And put it this way, if you know what the book’s title is in reference to, you need a copy. Don’t even give it another thought. Just click here and order your copy through Amazon. How did I come to have my eyes opened to this book? Well, one of the lovely people who wrote to express their sadness over my daughter’s inability to meet Batman was Ms. Becky Beard. Becky sent me an IM saying that she found Courtney’s story very upsetting. The only thing she found uplifting about the whole thing was Courtney’s addiction to the 60s Batman TV show. Several IM exchanges later, Becky said she was sending Courtney (and me) an autographed copy of “a book”, Gotham City: 14 Miles. Not having heard of the book before (go ahead: pelt me with rocks and garbage. I deserve it), I did a quick search and found that it was released in 2011 and consisted of a collection of essays edited by Jim Beard. Beard? Hey, wait a second! Simply put, this book is a gift from the Bat-gods! Almost 300 pages and I was done with it in under 24 hours. It’s that good. 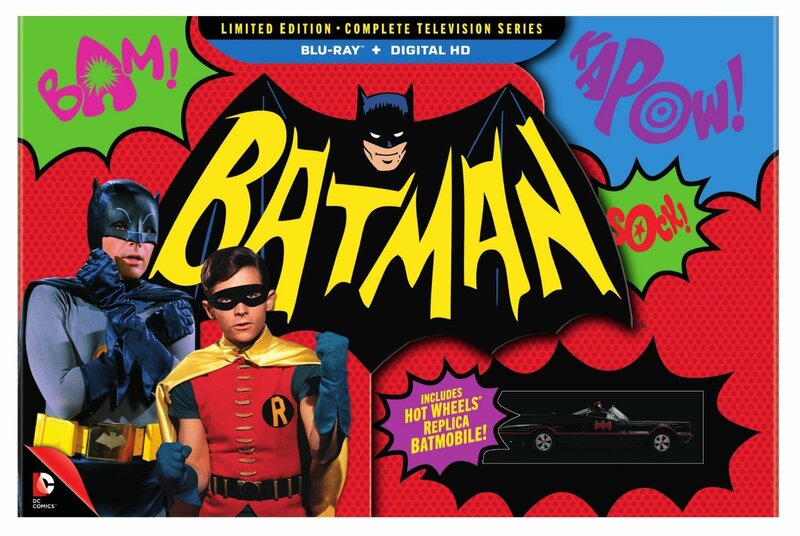 Nestled among the essays which touch upon the phenomena that was the 1960s TV show are deep-dives into such topics as the show’s music, visuals, and, of course, all those Bat-gadgets. Even 1966’s Batman: The Movie is covered. Courtney’s a bit too young to appreciate Gotham City: 14 Miles just yet, although she totally digs the pictures of all the guest villains out of their costumes. She did, however, ask that it be placed on her bookshelf next to the dog-eared copy of The Official Batman Batbook that she absconded with from her father’s collection. OK, enough reading: go get your own copy. And for the record, no, I’m not getting any kickbacks off any sales of the book. It’s just a damn good book that no Bat-fan should be without. Now if you’ll excuse me, Courtney and I need to stock up on snacks, get our mail forwarded, and make sure our matching Bat-PJs are clean: there’s 120 fully remastered (in HD) episodes heading to our house as we speak! 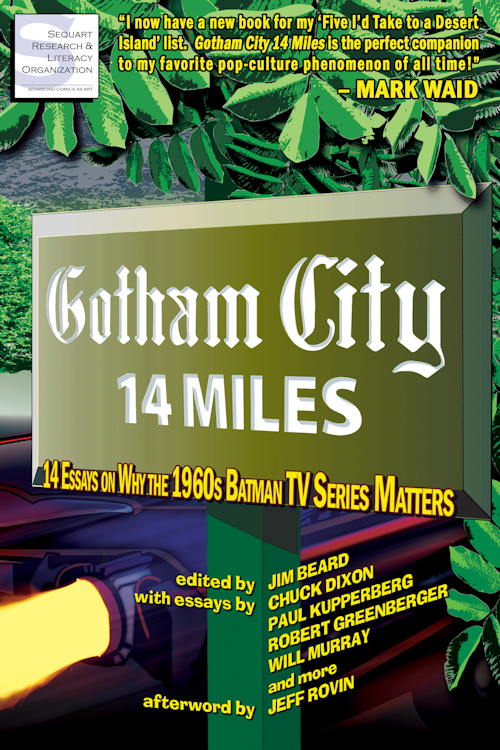 Check out Gotham City: 14 Miles on Facebook, here.